That’s not to say Romans won’t try to beat him. 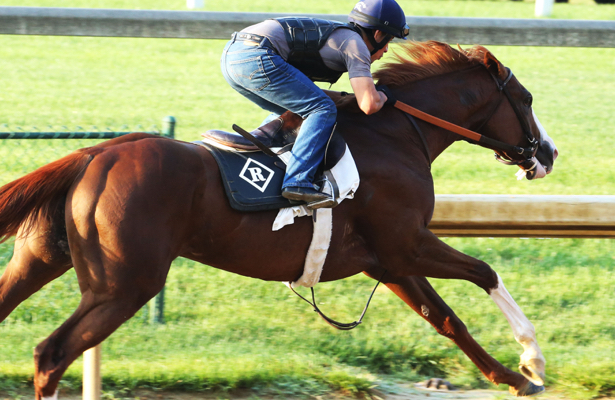 Free Drop Billy remains a candidate to run in the June 9 race in New York following a successful breeze Monday at Churchill Downs. The colt, a son of 2012 Belmont winner Union Rags marked with a distinct white blaze, will work once more before shipping. Should he go in the Belmont, Free Drop Billy would join Hofburg, Vino Rosso and Noble Indy as horses that competed in the Kentucky Derby but passed on the second leg of the Triple Crown, the Preakness Stakes. Romans said Free Drop Billy “did everything you’d like him to do” in his workout, looking happy and full of energy. Perhaps that bodes well for his chances in the 1 1/2-mile Belmont. “They’re only going to do it this one time in their life, most of them,” Romans said of the distance. “He’s bred to do it. His brother won a mile-and-a-half race in Dubai on the grass,” that being Hawkbill, who’s also out of the Giant’s Causeway mare Trensa and took this year’s Group 2 Dubai Sheema Classic. Free Drop Billy finishing a puzzling 16th in the Derby. He was also ninth in last November’s Breeders’ Cup Juvenile. Other than that, he has never missed the board. Romans still doesn’t have an answer for those outlying performances. Free Drop Billy gets the closer label, but speaking generally, Romans said “you don’t want to be coming from the clouds to win a mile-and-a-half race” such as the Belmont. So, will his charge sit closer to the anticipated pace setters?